Southampton Village Hall is located at 23 Main Street, Southampton NY 11968; phone: 631-283-0247. Photo: Mercator Cooper House, ca. 1684, 81 Windmill Lane, Southampton, NY. Photographed by User:Americasroof, 2007, [cc-by-2.5 (creativecommons.org/licenses/by/2.5/deed.en)], via Wikimedia Commons, accessed August, 2015. The Southampton Village Multiple Resource Area was listed on the National Register of Historic Places in 1986. Portions of the content of this web page were adapted from a copy of the original nomination document. Adaptation copyright © 2010, The Gombach Group. The Southampton Village Multiple Resource Area nomination contains the most intact historic areas and isolated individually significant properties in the incorporated village, all of which illustrate the community's development from 1640 to c. 1930. They include four historic districts that represent four distinct concentrations and development patterns of historic resources in the village and four individual properties that possess outstanding historic and architectural merit and are isolated from the historic districts by open land and/or modern development. The total number of properties within the Multiple Resource Area nomination includes 395, contributing buildings and 115 non-contributing buildings. The nominated districts and individual properties include the most historic, best preserved properties in the village and clearly represent the settlement, growth, and architectural heritage of this waterfront community. Southampton is located at the beginning of eastern Long Island's South Fork in the town of Southampton, 91 miles east of New York City. Access to this exclusive summer resort community is from the west along routes 27 and 27A. The 6.2 square mile village is relatively flat and has a luxuriant landscape and seven miles of frontage on the Atlantic Ocean. The waterfront area has a long low range of sand dunes running along the beach. The western half of the oceanfront is made up of a long narrow barrier beach which separates the Atlantic Ocean from the Shinnecock Bay to the north. The village's dramatic oceanfront combines long stretches of white sandy beaches, gently rolling sand dunes and fields of sea glass. A series of five ponds and the somewhat larger centrally located Lake Agawam are all situated just north of the oceanfront area and all have a similar tear drop shape. These scenic bodies of water greatly enhance the village's expansive, lushly planted landscape. The village street plan is irregular and its main thoroughfares generally follow the early settlement roadways. Access into the village from the west is along Hill Street, from the east along Hampton Road, and from the north along North Sea Road and Main Street. These primary access routes converge in the center of the village at the central business district. The compact business district is situated around Jobs Lane, Main Street, Windmill Lane, and Nugent Street. This commercial area has a low scale and is punctuated with distinguished civic buildings. Dense residential areas surround the business district on the north, east, and southeast. These pleasant tree-lined streets contain year-round middle-income and working-class residences; all are generally well maintained. The eastern portion of the village is relatively undeveloped with scattered farmsteads and open fields, some of which have been subdivided for modern residential development. The largest portion of Southampton's land area is the expansive enclave of upper-income summer houses called the summer colony and located to the south and southwest of the business district. The majority of these summer houses are situated on large, landscaped parcels of land. GW Lane, Dune Road, and Meadow Lane form one long continuous thoroughfare which parallels the Atlantic Ocean and contains some of the villagers most distinguished summer residences. The majority of Southampton's building stock is wood frame with wood shingle or clapboard sheathing. Exceptions include some of the large commercial and civic buildings in the business district, many of the mansions in the summer colony, and the buildings which surround the Railroad Station Plaza. For the most part, Southampton's wood frame architecture reflects eastern Long Island's historic vernacular building tradition, which originated with the area's seventeenth-century settlement, remained influential throughout the eighteenth and nineteenth centuries, and continues to pervade the region's twentieth-century architecture. The distinctive characteristics of this local building tradition are reflected in many of Southampton's buildings and include a prominent rectangular mass, broad gable roofs, three-bay side entrance or five-bay center entrance plans, wood frame construction, wood shingle or clapboard sheathing, and a minimum of decorative detail. The largest concentration of Southampton's wood frame architecture is found in the dense residential areas spreading out around the central business district. The Southampton Village Historic District includes a portion of the central business district, the dense residential areas to the north and west, and the large summer colony to the south. The district represents the historic core community of Southampton and includes 395 contributing properties and 115 non-contributing properties. The majority of the district is surrounded by non-historic modern residential development. The expansive Summer Colony forms the bulk of the district. Generally, this fashionable upper-income residential enclave is located south of Ox Pasture Road to the Atlantic Ocean, west of Lake Agawam to Coopers Neck Road, on the south side of Gin Lane along the beach front, and includes the residences surrounding Old Town Road. It encompasses the largest land area in the historic district and the village in general. The extensive inland portion of the nominated Summer Colony is relatively flat, its southern boundary includes the oceanfront beaches and sand dunes. The Summer Colony contains a substantial concentration of late nineteenth century and early twentieth century mansions which are set on large parcels of land; all contributing outbuildings and related landscapes are included in the district boundaries. Each street in the Colony contains high quality residential architecture which is enhanced by well-maintained grounds. The areas along Lake Agawam and the Atlantic Ocean display some of the Colony's most conspicuous mansions due to their dramatic, relatively open waterfront settings. In most cases, the beachfront properties have informal landscapes which retain the indigenous plant material (scrub pine and oak). Many of the beachfront mansions were built on the crest of the sand dunes, making them prominent buildings in the overall landscape and providing them with panoramic views. The inland Summer Colony mansions have more formal landscapes, usually including window driveways, broad lawns, mature trees, and small formal gardens. The majority of Summer Colony roadways and properties are enclosed by high private hedges which, for most of the year, make them invisible from the public roadways. The Colony's large concentration of mansions display a variety of fashionable turn-of-the-century architectural idioms, primarily the Colonial Revival and Shingle styles, with fewer scattered examples of Neoclassical and Tudor Revival styles. The typical Summer Colony residence is a large rambling, Shingle style mansion with a broad gable or gambrel roof, numerous windows, wraparound porches, and restrained Colonial Revival style detail. Many of the mansions have related historic outbuildings such as garages and guest cottages. As a result of the large lots and extensive plantings, most Summer Colony mansions are not visible from one another. A sampling of the Colony's distinguished residential architecture includes the handsome Shingle style mansion at 509 First Neck Lane, the picturesque residence at 136 Great Plains Road, the impressive Tudor Revival Mansion at 228 Ox Pasture Road, the Neoclassical Mansion at 242 Great Plains Road, the Colonial Revival residence at 80 Wyandanch Lane, the Shingle style house at 195 Ox Pasture Road and the massive Colonial Revival style mansion at 2 Meadow Lane. These examples represent a small sampling of the quantity and quality of upper-income residential architecture in the Summer Colony. A small number of non-residential buildings are scattered along the Summer Colony's waterfront. These properties serve the surrounding residential area and also reflect the village's turn-of-the-century prosperity. Distinguished examples include the picturesque St. Andrew's Church on Dune Road at the southern end of Lake Agawam, the Colonial Revival style Meadow Club at 555 First Neck Land, and the rambling Spanish Colonial Revival style Southampton Beach Club building next to St. Andrew's Church on Dune Road. The historic core of the central business district is included in the nominated district. It displays a distinctive mixture of low-scale commercial buildings and distinguished civic architecture located along Job's Lane and Main Street (between Job's Lane and Hampton Road). The earliest building in the business district is the Pelletreau Silver Shop at 80 Main Street. It is one of a small group of seventeenth-century buildings that survive in the village and recall Southampton's early settlement (which was situated along Main Street and South Main Street). This rare surviving building exhibits all the distinctive characteristics of eastern Long Island's historic vernacular building practices including wood frame construction, wood shingle sheathing, gambrel roof, and an undecorated exterior and interior. The majority of buildings in the business district were constructed during the late nineteenth and early twentieth centuries and share uniform setbacks and low scale (one to three stories) on tree-lined streets. This architecture ensemble includes large wood frame and sheathed commercial/residential buildings with prominent gable roofs and one- and two-story wood frame and masonry commercial buildings with storefronts, flat roofs, and decorative cornices. Several distinguished, turn-of-the-century civic and commercial buildings and the picturesque village park punctuate and greatly enhance the business district's overall historic appearance. Notable buildings include the Colonial Revival store complex at the northeast corner of Main Street and Meeting House Lane, the Neoclassical bank building at the southeast of Main Street and Cameron Street, the prominent former town hall at the northeast corner of Main Street and Hampton Road, the Neoclassical Village Hall on the west side of Main Street, the Jacobethan Revival Rogers Memorial Library at 4 Main Street, the picturesque store complex at the southwest corner of Main Street and Jobs Lane, the handsome Parish Art Museum on the north side of Jobs Lane, and the large Waterside Village Park at the southeast corner of Job's Lane and Pond Lane. These buildings and park display an unusually high level of architectural quality and fine workmanship recalling Southampton's prosperity as an exclusive resort community at the turn-of-the-century. The Village Park is particularly picturesque with its broad lawns, mature plantings, and Neoclassical war monument at its southern end. A large, early nineteenth century Greek Revival style mansion stands on the eastern edge of the business district (on the north side of Meeting House Lane). Despite a twentieth-century subdivision of its front lawn, the handsome residence recalls an important episode in the village's early nineteenth century development. It also retains the primary hallmarks of the Greek Revival style and is one of Southampton's most distinguished nineteenth-century residences. The Hill Street portion of the Southampton Village Historic District contains a long, uninterrupted streetscape of historic properties and follows the primary western access roadway into the village. The buildings along its route date from all phases of the community's historic development. Scattered along its length are eighteenth, nineteenth, and early twentieth century residences, the majority of which display the primary characteristics of the local historic building tradition. Notable features include prominent rectangular compositions (many with secondary wings), three-bay side entrance hall and five-bay center entrance hall plans, wood frame construction, wood shingle and/or clapboard sheathing, broad gable roofs, and an overall lack of ornamentation. Distinctive examples of this pervasive tradition include 241 Hill Street, 345 Hill Street, and the row of houses on the south side of Hill Street between First Neck Lane and Rosko Drive. The western end of Hill Street is somewhat more sparsely developed; its largely intact historic buildings are smaller in scale, more modest in appearance, and have wider spaces between them. Scattered among Hill Street's primarily middle-income dwellings are prominent early twentieth century properties; these consist of the late Gothic Revival style church complex at 168 Hill Street, the handsome Colonial Revival style Southampton Club building at 53 Hill Street, and the turn-of-the-century Breese-Merrill Mansion (individually listed on the National Register, April 18, 1980); this is the only estate established on Hill Street. Generally, all the Hill Street properties are set on large lots, are well-maintained, and have manicured landscapes. The area's continuous concentration of historic properties and mature roadside trees provide Hill Street with a picturesque historic setting. The North Main Street, North Sea Road, and Bowden Square area of the district contains a significant concentration of eighteenth- and nineteenth-century historic properties. North Main Street in particular retains several eighteenth-century dwellings which remain largely intact and reflect the community's historic vernacular building practices. Notable features include three-bay side entrance hall and five-bay center entrances hall plans, wood frame construction, wood shingle and clapboard sheathing, prominent gable and gambrel roofs, and an overall lack of decorative detail. Representative examples include 126 Main Street, 17, 49, and 80 North Main Street. Bowden Square is a short, wide roadway which contains a small enclave of nineteenth century residences and is punctuated by a large brick, late nineteenth century commercial and residential building on its west side at 243-247 Windmill Lane. The Bowden Square area is surrounded by non-historic modern residential neighborhoods and its uninterrupted concentration of historic buildings clearly defines and encloses the district's northern boundary. North Main Street also contains many distinctive examples of late nineteenth century domestic architecture including several two-story, three-bay, side entrance hall houses with street facing gable ends. Number 40 North Main Street is a good example of a large, upper-income, Queen Anne style residence which retains numerous hallmarks of the idiom including an asymmetrical plan, wraparound porch, prominent corner tower, and decorative detail at the porch and roofline. This area also contains an eighteenth- and nineteenth-century cemetery which retains many well-preserved headstones. Across Windmill Lane from the cemetery is the undeveloped site of a late eighteenth century British Fort which is now used as a village park; its archeological significance has not been investigated. Although primarily residential, this area has two distinguished religious properties: the handsome United Methodist Church at the northeast corner of Main Street and Post Crossing and a smaller but equally intact church at 210 Windmill Lane. Bowden Square, North Main Street, and North Sea Road contain a distinguished collection of historic buildings and the mature roadside trees and overall uniformity of scale, design, and setbacks enhance the area's intact historic appearance. The northwestern portion of the nominated district encloses a largely intact turn-of-the-century (1900) residential neighborhood. The Post Crossing, Elm Street, Little Plains Road, and Lewis Street area contains a distinguished collection of late nineteenth and early twentieth century wood frame, middle-income domestic architecture. The uninterrupted historic streetscapes contain buildings which display local interpretations of popular turn-of-the- century architectural styles, primarily the Queen Anne, Shingle, and Colonial Revival styles. Most of the buildings are large two-story gable or hip-roofed dwellings with wood shingle sheathing, generous front porches, and a variety of Colonial Revival style detail. Notable examples include 65,92, and 104 Post Crossing, 103 Elm Street, 70 Little Plains Road, and 31 and 39 Lewis Street. This primarily residential area is punctuated by two prominent early twentieth century schools. Both are situated on Hampton Road (facing Elm Street) and are prominent examples of Neoclassical civic architecture in the village. Generally, the area exhibits a uniformity of design, attention to detail, scale, setback, and landscape all of which reinforce the neighborhood's cohesive historic setting. South Main Street is the nominated district's most picturesque street and contains an architecturally distinguished collection of buildings which reflect every phase of Southampton's historic development. The village's oldest extant building is situated in the middle of South Main Street. The rare surviving 1662 Halsey House is an outstanding example of early settlement period architecture on eastern Long Island; distinctive features include its two-story center entrance, central chimney plan, salt box profile, wide wood shingle sheathing, and unornamented exterior and interior. A small group of later seventeenth-century and eighteenth-century houses also survive on South Main Street and are representative of Long Island's historic vernacular building tradition. Notable examples include the Mackie House at 129 South Main Street, and 85, 90, and 95 South Main Street. All of these display the distinctive characteristics of the vernacular building tradition including the three-bay side entrance hall and five-bay center entrance hall plans, broad gable roofs, wood shingle and clapboard sheathing and an overall lack of decorative detail, In addition, a settlement era cemetery survives in this area and is included in the nominated district. It is situated on the north side of Post Lane and retains several eighteenth-century headstones. A scattered mixture of nineteenth and early twentieth century residences completes South Main Street's historic building stock. A broad sampling includes the 1875 Italianate style DeBost residence at 220 South Main Street, the handsome Queen Anne style homes at 67 and 75 South Main Street, and the large Shingle style mansion at 173 South Main Street. The primarily residential streetscape is punctuated by St. John's Episcopal Chapel, which retains its picturesque, stucco covered exterior. A small collection of early twentieth century homes adjacent to South Main Street are also included in the district. These largely intact, middle-income residences on Herrick Road display distinguished Colonial Revival style designs which contribute to the area's historic architectural heritage. The North Main Street Historic District contains a cohesive concentration of historic residential architecture along North Main Street (north of the railroad tracks) and the adjacent Railroad Station Plaza area which contains a small enclave of transportation-related buildings. The nominated portion of North Main Street and the Railroad Plaza is a distinct historic district which is separated from the Southampton Village Historic District by non-historic, modern residential and commercial areas. The nominated district contains twenty-four contributing buildings and two non-contributing buildings. North Main Street was sparsely settled during the mid eighteenth century with scattered farmsteads. This northern portion of the village remained agricultural through the late nineteenth century. Its most extensive period of growth was at the turn-of-the-century when Southampton was experiencing rapid summer resort development. As a result of its proximity to the active Railroad Plaza, North Main Street evolved into a primarily middle income, working-class residential neighborhood which served the fashionable vacation community. All the North Main Street residences within the district are wood frame, have one and one-half or two stories, and have wood shingle or clapboard sheathing. The majority of the buildings were constructed between the late nineteenth and early twentieth centuries; however, there are a few scattered eighteenth and early nineteenth century dwellings. All the houses have generous landscaped lots and uniform setbacks along the wide tree-lined street. The nearby Railroad Plaza contains a small, widely spaced enclave of transportation-related buildings including the handsome railroad station (with its cobblestone and oyster shell exterior), wood freight station, brick warehouse, and wood frame commercial building. All these buildings are arranged around a broad plaza with parking area and small wooded park. The Railroad Plaza area is visible from the North Main Street residential neighborhood and together they convey a unified historic district appearance which reflects the village's year-round, middle-income residential and commercial development during the late nineteenth and early twentieth centuries. The Wickabogue Road Historic District is located in the easternmost, portion of the village along Wickabogue Road. Its boundaries enclose a small collection of largely intact farmsteads which constitute a distinct historic agricultural area in the community and clearly reflects Southampton's Agrarian Development. Its spacious flat landscape with scattered clusters of farm buildings is unlike the other three, more densely built up, residential historic districts. This nominated portion of Wickabogue Road has a strong historic agricultural appearance due to its picturesque farmsteads and interviewing fields, which are clearly defined by the surrounding, non-historic modern residential development. The nominated district has a total number of seventeen contributing buildings and two non-contributing buildings. The six historic farmsteads with the district are randomly situated along both sides (north and south) of Wickabogue Road. They all have substantial main houses situated close to the tree-lined road with clusters of various farm support buildings behind these large farmhouses. All the buildings within the district reflect eastern Long Island's historic vernacular building tradition. Distinctive features include wood frame construction, wood shingle or clapboard sheathing, prominent gable roofs (most with street-facing gable ends), three-bay side entrance hall or five-bay center hall plans, one-story front porches, and an overall lack of ornamentation. Most of the houses have prominent main blocks with smaller side or rear wings. Decorative detail, if it exists, is limited to rooflines and porches. The farm support buildings vary in size but all have plain wood sheathed exteriors and gable or shed roofs. The Wickabogue Road Historic District conveys a uniformity of historic architecture and setting due to its wide tree-lined road, flat agricultural landscape and informally arranged farmsteads dating from various periods of its development which are set amid clusters of mature trees. Its overwhelming Agrarian appearance contrasts with the other residential historic districts which display dense concentrations of year-round and seasonal domestic architecture. The Beach Road Historic District is the fourth and last district in the multiple resource area. It is located along Beach Road at the beginning of the village's Western Barrier Beach, a long narrow strip of land which separates the Atlantic Ocean from Shinnecock Bay. Although its architecture and setting is similar in appearance to the Summer Colony ocean-front area in the Southampton Village Historic District, this small enclave of prominent mansions is separated from the larger district by non-historic, modern residential development and open land. The district includes nine contributing buildings and four non-contributing buildings. A distinguishing feature which sets this district apart from the other districts is that all the mansions are some of the largest, most conspicuous buildings in the village and they are all prominently sited on the crest of the long low range of sand dunes which run along the Atlantic Ocean. Unlike the majority of wooden buildings in the village core, the primary historic buildings in this district have brick and stucco exteriors, complex compositions and rooflines, and elaborate decorative detail. The district's mansions sit on large parcels of land set back but visible from the indigenous ocean side vegetation of sea grass, scrub pine, and low bushes. Although some modern houses have been constructed between the estates, the overriding character of the district is of grand mansions prominently situated within a natural seaside setting. This is particularly evident when viewing the district from the Atlantic Ocean beachfront. The individual mansions within the district display stylish early twentieth century architectural idioms including Georgian Revival, Spanish Colonial Revival, and an eclecticism which combines rambling, asymmetrical building forms covered with steep gable or hip roofs, and numerous dormers. Generally, the Main Beach Road facades of the mansions are more formal in plan than the many-windowed oceanside facades. When this series of estates was constructed, this section of Beach Road emerged as the most exclusive residential enclave in the village. In addition to the four nominated historic districts, four isolated individually significant properties were identified in the multiple resource area. These individual components include; the Captain Mercator Cooper residence  at 81 Windmill Lane, the Captain C. Goodale residence at 300 Hampton Road, the handsome residence at the northwest corner of Herrick and Little Plains Roads called Balcastle, and the Dr. Wesley Bowers residence on the south side of the Beach Road Historic District. The Captain Mecator Cooper residence at 81 Windmill Lane is located on the western edge of the Central Business District. It is separated from the nearby Southampton Village Historic District by modern, non-historic commercial development. This individual component property includes a handsome residence located on a hill overlooking the business district and a small group of historic out buildings for a total number of four contributing buildings. The residence is particularly prominent in the densely built up commercial district due to its large size, distinguished exterior with handsome Greek Revival style details, and spacious landscaped grounds. The Captain C. Goodale residence at 300 Hampton Road, a busy thoroughfare, is located in an eastern, inland residence section of the village. The distinguished Second Empire style residence is situated on the south side of Hampton Road and is clearly separated from the Southampton Village Historic District by a densely developed, modern residential neighborhood. This individual component property includes a handsome house and detached privy set on a generous (one-acre) landscaped village lot for a total of two contributing buildings. The residence is conspicuous in this section of the village due to its large size, distinctive architectural detail, and non-historic surroundings. The Dr. Wesley Bowers residence is located on Beach Road west of the Beach Road Historic District. This handsome oceanfront mansion is clearly separated and isolated from the Beach Road Historic District by open land and modern residences. This individual property includes a rambling, Spanish Colonial Revival style residence and open garden pavilion set in an informal seaside landscape for a total number of one contributing building and one contributing structure. Like the buildings in the Beach Road Historic District, the Bowers residence is a large stylish mansion which is prominently situated on the crest of a sand dune. It is located on the western most portion of Southampton's Barrier Beach and is relatively isolated from the built-up village core. All the components within the multiple resource area nomination represent the most recognizable historic areas and individual properties in the village. The vast collection of nominated properties reflects the community's historic development and architectural heritage from its seventeenth-century settlement to its rapid transformation into a fashionable oceanfront resort during the early twentieth century. The Southampton Village Multiple Resource Area includes four individual properties and four historic districts which represent Southampton's historic and architectural development from its mid-seventeenth century settlement to the early twentieth century (circa 1930). As a whole, the components of the nomination reflect the settlement and growth of the village from its early agrarian culture in the seventeenth, eighteenth, and first half of the nineteenth centuries to its rapid transformation into a fashionable, upper-income vacation retreat during the late nineteenth and early twentieth centuries. The nomination contains a small, remarkable intact collection of seventeenth- and eighteenth-century dwellings which are important reminders of Southampton's initial development and reflect the region's vernacular wooden building tradition. Distinguishing features include side and center entrance hall plans, heavy wood frame construction, wood shingle sheathing, and an overall lack of ornamentation. The 1662 Halsey Homestead on South Main Street is the oldest building in the village and a rare surviving early settlement period dwelling on eastern Long Island. A dense concentration of well-preserved nineteenth-century residential architecture forms the nucleus of the nomination and reflects the village's historic vernacular building practices. This ongoing tradition was established in the seventeenth century and remained in use up into the late nineteenth century. The survival of such a large number of largely unaltered vernacular dwellings from the seventeenth through mid-nineteenth centuries in the multiple resource area is exceptional due to the extensive development pressure that continues to be exerted on Southampton and Long Island's South Fork. The multiple resource area also includes a compact historic central business district which has solid, turn-of-the-century commercial building stock, interspersed with distinguished civic buildings. A large portion of the multiple resource area constitutes an impressive inventory of stylish, turn-of-the-century summer residences. Many of these skillfully combine the simple forms and native materials of the local historic building tradition with popular period architectural details, primarily the Shingle and Colonial Revival styles. These buildings, most of which are concentrated in the southwestern portion of the village called the Summer Colony, are distinguished by their large size, handsome architectural details, and high level of craftsmanship. Many of these same properties are significant as representative works of locally and regionally prominent architects and architectural firms including McKim, Mead, and White; Robert H. Robertson; Bruce Price; Peabody, Wilson, and Brown; John Russell Pope; Carrere and Hastings; and Walker and Gillete. As a group, these buildings reflect the architectural tastes and affluent lifestyles of the many prominent American families who were attracted to Southampton's scenic oceanfront. Southampton's collection of distinguished buildings is enhanced by its long history as well as its attractive visual qualities. The dense, cohesive concentration of historic properties which constitute the core of the village display a uniformity of design, materials, workmanship, setbacks, tree-lined streets, and well-maintained, landscaped lots. The outlying summer colony contains distinguished properties set within vast, lushly planted grounds. The village's scenic oceanfront and picturesque ponds further enhance Southampton's historic architecture. The Southampton Village Multiple Resource Area contains the most significant and intact historic resources associated with the community's mid-seventeenth century settlement, eighteenth and nineteenth century agrarian growth, and late nineteenth and early twentieth century development as an exclusive summer resort. The village was first inhabited by the Shinnecock Indians and the Shinnecock Indian Reservation is presently located just west of the village's western boundary. In 1640, Southampton was settled by nineteen families from Lynn, Massachusetts. The early isolated settlement was situated just north of Old Tom Road; this area is presently undeveloped and its archeological significance has not been investigated. Later in the seventeenth century, the early settlement shifted to South Main Street and slowly spread into the present central business district. A small group of buildings survive from this settlement period and are located in the Southampton Village Historic District. Notable examples include the 1662 Halsey Homestead on South Main Street, the mid-eighteenth century John Mackie House, also on South Main Street, and the late seventeenth century Pelletreau Silver Shop on Main Street at the center of the historic business district. These and the other seventeenth and eighteenth century buildings share construction techniques that are indicative of eastern Long Island's historic vernacular building tradition, which was established in the mid-seventeenth century and remained in active use up to the mid-nineteenth century. Distinctive characteristics, include: heavy timber frame construction, wood shingle sheathing, three-bay side entrance hall and five-bay center entrance hall plans, broad gable or gambrel roofs, multi-pane single-hung windows, and an absence of decorative detail. In addition, two settlement era cemeteries survive in the village and are included in the Southampton Village Historic District. They both contain eighteenth-century graves, many with well-preserved carved headstones; the old town burying ground is located just east of South Main Street and the other cemetery is situated between North Main Street and Windmill Lane. Southampton grew gradually during the eighteenth century. The sparse development along Main Street expanded into a small village. Hampton Road, North Main Street, North Sea Road, and Hill Street all provided access into the village from east, north and west. During this period, these roads ran across undeveloped farmland and converged at the village center. Southampton's historic development pattern follows these primary access roads and is densest around the Main Street area. Agriculture and to a lesser extent, fishing were the mainstays of the village's early economy and farming remained the community's primary commercial activity for over 200 years. Scattered farmsteads were established in Southampton's outlying areas during the eighteenth century and several historic farm complexes are included in the multiple resource area. The eighteenth and nineteenth-century farmsteads which constitute the Wickabogue Road Historic District form a cohesive, largely intact, historic agricultural enclave. Its open, rural appearance is unlike any of the other more densely built-up districts or individual, architecturally distinguished properties and clearly represents the community's historic agrarian heritage. Its rural aspect is enhanced by largely intact, vernacular farmhouses and support buildings which date from all phases of Southampton's development and are set in an uncompromised agricultural landscape. A small, significant collection of eighteenth- and nineteenth- century farmhouses are also randomly scattered around the Southampton Village Historic District and North Main Street Historic District. These well-recognized local landmarks have a variety of construction dates and display a wide range of building types from the unadorned 1740 settlement era Bishop residence in the North Main Street Historic District to the stylish, early nineteenth century Greek Revival style residence on Meeting House Lane in the Southampton Village Historic District. Other distinguished examples include the 1750's, three-bay, two-story, side entrance hall dwelling with side wings at 219 North Main Street; the late nineteenth century, restrained Italianate style house at 305 North Main Street; the 1770 settlement era Halsey House at 345 Hill Street, the 1840, three-bay, two-story, side entrance hall residence at 659 Hill Street; and the 1760 five-bay, one-story, center entrance hall farmhouse at 100 South Main Street. Southampton retains a remarkably unchanged concentration of eighteenth- and nineteenth-century farmhouses and farmsteads interspersed throughout the nominated districts. Although the Wickabogue Road Historic District most clearly recalls Southampton's agricultural heritage, these scattered farmhouses also represent the historic agrarian development that characterized the village from its settlement up into the mid-nineteenth century. The British occupied the village from 1777-1779. Evidence of Southampton's Revolutionary War period is recalled at the British Fort Site on Windmill Lane; this area is an undeveloped park and its potential archeological significance has not been investigated. 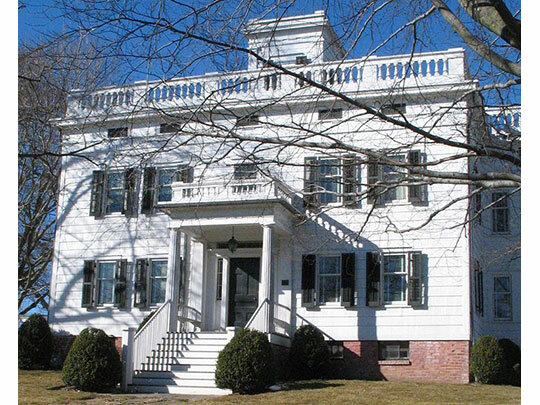 In addition, British General Erskin was headquartered at the Herrick House at 17 North Main Street (located in the Southampton Village Historic District) during the winter of 1778-1779. Historically, the Revolutionary War era represents a brief interlude in the village's overall development and by the late eighteenth century it had returned to a small, somewhat isolated, sparsely settled farming community. Southampton's growth after the Revolution and during the first half of the nineteenth century was slow-paced. The village center gradually expanded along Main Street and Jobs Lane. The expansive surrounding portions of the core community remained relatively undeveloped with scattered farmsteads and broad cultivated fields. Buildings constructed during this time period continued to reflect the local vernacular building tradition. Three-bay side entrance hall and five-bay center entrance hall dwellings remained the housing types most frequently built. Representative examples can be found throughout the Southampton Village Historic District and, to a lesser extent, in the North Main Street Historic District. In 1870, the Long Island Railroad linked Southampton with western Long Island and New York City. Its completion marked the beginning of the end of the village's isolated, bucolic existence. Its construction represents the single most influential force in the community's historic development. As a result of its newly established accessibility, Southampton's picturesque rural setting, luxuriant landscape and scenic ponds and oceanfront quickly attracted large numbers of summer visitors during the last quarter of the nineteenth century. At first, the visitors rented village houses or rooms within year-round residences. Some of these residences were opened up as boarding and tourist houses. As Southampton's popularity increased, many wealthy families from New York City regularly visited the village and purchased large parcels of land in the village's undeveloped outlying areas, primarily around Lake Agawam and near the Atlantic Ocean beachfront. These prominent families hired regionally prominent architects and skilled local builders to construct large, comfortable summer houses in popular period architectural styles. By the turn-of-the-century, Southampton was firmly established as an exclusive upper-income vacation retreat serving the New York City Metropolitan area. The community continued to develop in the early twentieth century with many larger more elaborate estates being built in the southern portion of the village and along the oceanfront. The majority of this historic Summer Colony is included in the Southampton Village Historic District. The village core also expanded. Main Street and Jobs Lane emerged as a prosperous business district with handsome civic buildings and fashionable shops. The surrounding year-round residential neighborhood kept pace with the village's increased prosperity and grew to include a dense concentration of working-class and middle-income residences. The largely intact historic Central Business District and cohesive residential areas on the north and east constitute the core of the Southampton Village Historic District. The area to the north around the Railroad Plaza also expanded. The present Masonry Railroad Station was built in 1902 and replaced a wood frame building. Its carefully detailed exterior provides a distinguished introduction to this picturesque resort community when traveling by train and reflects the village's turn-of-the-century affluence. As a result of the increased activity around the Railroad plaza, the nearby residential areas grew. The North Main Street Historic District includes the intact core of this area's early twentieth century commercial and residential development. The village reached the peak of its resort development during the 1920's. The Summer Colony emerged as a vast, cohesive enclave of distinguished estates, each displaying a variety of high quality architectural design and workmanship. Southampton's unprotected western barrier beach was opened to development in the 1920's and some of America's most prominent families, including the Mellons and Duponts, built grand mansions prominently sited on the beachfront's long low range of sand dunes. Due to their somewhat isolated location within the village, these mansions form a small distinctively separate residential enclave from the Summer Colony and constitute the Beach Road Historic District. Construction in Southampton declined sharply after the financial panic of 1929. The early 1930's saw very little development in the village. As a result, the multiple resources area's period of historic and architectural significance closes in 1930. Southampton's historic architectural development represents a study in contrasts as a result of its rapid transformation from a small, established farming village to an exclusive summer retreat of the wealthy during the late nineteenth and early twentieth centuries. The historic properties as a whole exhibit a dichotomy in construction techniques, overall design, and attention to detail. For example, the multiple resource area nomination contains an extensive collection of seventeenth, eighteenth, and nineteenth century dwellings and support buildings which reflect eastern Long Island's vernacular building tradition and its simple historic agrarian culture. This pervasive local building tradition can be traced to the community's seventeenth-century settlement. Its conservative construction practices remained in widespread use throughout the eighteenth century and up into the mid-nineteenth century. As a case in point, the early nineteenth century residences fund in the densely built-up portions of the Southampton Village Historic District, the North Main Street Historic District, and the Wickapogue Road Historic District display many of the same primary building features as the 1662 early settlement period Halsey Homestead on South Main Street. Distinctive characteristics of this ongoing tradition include heavy wood frame construction, wood shingle sheathing, single multi-pane windows, an unadorned rectangular mass, prominent gable and gambrel roofs, and an overall lack of ornamentation. In contrast, the multiple resource area nomination also contains an extensive concentration of late nineteenth century and early twentieth century mansions which represent Southampton's rapid development as a fashionable summer resort community at the turn-of-the-century. These historic properties constitute the expansive southern portion of the Southampton Village Historic District and the entire Beach Road Historic District. Many of the summer residences were designed in popular period American architectural styles. The styles of choice during the late nineteenth century and the first decade of the twentieth century were the Queen Anne, Shingle, and Colonial Revival idioms. During this time period, a large number of houses were built which skillfully combined the hallmarks of these popular architectural styles with elements from eastern Long Island's historic vernacular building tradition. For example, many of the residences embody the form and decoration of the Shingle and Colonial Revival styles while also reflecting the local vernacular building tradition in their unpainted wood shingle exterior, prominent gable and gambrel roofs, and five-bay center entrance hall plans. The most recognizable difference is that the summer houses are much larger than the village's modest vernacular building stock and the mansions have been embellished with elegant Colonial Revival style details. Southampton's picturesque turn-of-the-century summer residences successfully exhibit the maxims of the Shingle and Colonial Revival styles, which borrow from seventeenth-century New England and eastern Long Island architecture. As a result, Southampton's resort era architecture reflects and complements the village's historic vernacular building tradition. Southampton experienced the peak of its historic resort development between 1910 and 1930. The estates built during this period were larger and more grandiose than those constructed at the turn-of-the-century. The most popular styles were the Georgian Revival, Jacobethan Revival, and Spanish Colonial Revival idioms. The choice of building materials changed with the architectural styles and brick, stucco, and stone replaced the wood shingle sheathing that had previously been prevalent. Southampton's distinguished early twentieth century civic and commercial buildings, located primarily in the Central Business District, also reflect the village's resort era prosperity and high quality architecture. Most of these non-residential buildings reflect the same architectural styles that influenced the Summer Colony mansions. Before the village emerged as an exclusive vacation retreat, Southampton's architectural development was gradual and followed the region's 200 year old vernacular building customs. Its simple, unadorned wood frame buildings reflect the community's working-class agrarian culture. Historically, the area's livelihood was farming and dependent on the relative success and/or failure of the growing seasons. The local vernacular architecture was built to serve the basic human and agricultural requirements to provide shelter and protection from the natural elements. As a result, the village's seventeenth, eighteenth, and first half of the nineteenth century architecture represents a uniform, conservative, and functional approach to building which clearly lacks extraneous ornamentation. If a family prospered and decorative detail was applied to their farmhouse, it was almost always limited to the main entrance and/or front porch. Clear exceptions to this rule and to the local building tradition in general are the Captain Mecator Cooper Residence (individual component property) and the large residence on Meeting House Lane on the eastern edge of the historic business district. Both of these buildings are distinguished early nineteenth century residences which display all the distinctive characteristics of the Greek Revival style and retain elegant classical details. They are well-recognized local landmarks and reflect their original owners' prosperity, local prominence, social aspirations, and sophisticated architectural tastes. The majority of Southampton's pre-resort era architecture includes much smaller, simpler buildings which follow the local vernacular building practices. Distinctive characteristics include heavy wood frame construction; wood shingle sheathing; a prominent rectangular mass; broad gable or gambrel roofs; single, double-hung, multi-paned windows with simple trim, three-bay side entrance or five-bay center entrance plans, and an overall lack of decorative detail. This widespread local building type is densest at the village center along South Main Street, North Main Street, Bowden Square, and scattered along Hill Street (all within the Southampton Village Historic District). This large, well-preserved concentration of buildings dates from the early settlement period (1660's), through the eighteenth century, and well into the first half of the nineteenth century. The Southampton Village Historic District and North Main Street Historic District retain the highest concentrations of the village's historic vernacular architecture. These districts, and the Southampton Village Historic District in particular, also contain numerous buildings associated with Southampton's extensive resort development. As a result, these two districts represent each phase of the village's historic development. In contrast, the Wickapogue Road Historic District is unique within the multiple resource area as it only represents Southampton's Historic agricultural heritage. It contains a small, cohesive collection of farmsteads. Its unadorned farmhouses and support buildings date from all phases of Southampton's development and reflect the village's historic vernacular building tradition. This district is a locally important, rare surviving reminder of the community's historic agrarian settlement and growth. Its uncompromised rural appearance recalls Southampton's outlying areas before their extensive late nineteenth century resort development. The Captain C. Goodale Residence, an individual component property on Hampton Road, is a large architecturally distinguished house built during the late nineteenth century which is not associated with the village's extensive resort development. It is located inland away from the fashionable Summer Colony and, like the Captain Mecator Cooper Residence, is indicative of Southampton's year-round historic architectural development. Constructed in 1875 by a prosperous ship captain, it is one of the best examples of Second Empire style residential architecture in the village. It retains all the salient characteristics of the style including a high mansard roof, prominent dormer windows, decorative bracketing, and a projecting entrance pavilion . While Southampton's pre-resort architecture represents the basic, utilitarian housing and storage needs of the village's historic year-round agrarian culture, its late nineteenth and early twentieth century mansions reflect the community's dramatic development into an exclusive summer retreat of great wealth and beauty. The large southern portion of the Southampton Village Historic District and the entire Beach Road Historic District contain the extent of the village's historic upper-income residential resort development. According to local records, the DeBost House at 220 South Main Street in the Southampton Village Historic District is the first residence constructed in the village solely for summer use. Built in 1875, it combines the two-story, five-bay, center entrance hall plan of the local vernacular building tradition with restrained Italianate style decoration including roof line bracketing, a low hip roof, and prominent cupola. Its construction led the way for the extensive residential summer resort development in the surrounding areas. Between the 1880's and 1890, many large summer houses were built, the majority of which display restrained Queen Anne, Colonial Revival, and Shingle style designs. These picturesque idioms were based on Colonial American sources and complemented the community's historic vernacular building stock. Hallmarks of these styles include informal massing clapboard and wood shingle sheathing, generous porches, broad roofs, and restrained classical details. The late nineteenth century properties were randomly scattered throughout the Summer Colony depending on the availability of land; this area was still in active agricultural use during this time period. During the early twentieth century, as the outlying farmland continued to be sold off for summer house construction, the Summer Colony quickly took on its present cohesive historic appearance. The Summer Colony's period architectural quality is consistently high on all its streets. A small random sampling of the Southampton Village Historic Districts distinguished residential resort architecture includes: "Wyndecote" a picturesque residence at 354 South Main Street built in 1887 and designed by Robert H. Robertson (who also designed the village library and remodeled St. Andrew's Church on Dune Road in 1883); the 1889 Colonial Revival style Parrish Residence at 409 First Neck Lane, designed by McKim, Mead, and White; the Colonial Revival style Judge Horace Russell Mansion on Ox Pasture Road, built in 1889 and designed by Bruce Price; the large Arts and Crafts style Ely Mansion on Ox pasture Road, built in circa 1900 and designed by Grosvenor Atterbury; the 1902 Colonial Revival style Meadow Club on Meadow Road, designed by James Brown Lord; the Colonial Revival style Livingston Residence, built in 1911 and designed by Trowbridge and Livingston; the picturesque circa 1913 Trevor Mansion on Coopers Neck Lane designed by Grosvenor Atterbury; "Fairways," a large Shingle style mansion built in 1916 and designed by John Russell Pope; the Spanish Colonial Revival style Rogers Estate on Old Town Road, built in 1921 and designed by Walker and Gillette; and the Spanish Colonial Revival style Bathing Club on Dune Road, built in 1928 and designed by Peabody, Wilson and Brown. Many distinguished, non-residential buildings were also constructed during the late nineteenth and early twentieth centuries and reflect the community's prosperity as a result of its extensive resort development and building boom. Notable examples, located primarily in the Southampton Village Historic District include the Queen Anne style United Methodist Church at 160 Main Street, constructed by local builder Madison Jagger; the handsome Rogers Memorial Library at the northwest corner of Jobs Lane and Main Street, built in 1895 and designed by Robert H. Robertson; the distinguished 1898 Parish Art Museum at 25 Jobs Lane and the Colonial Revival style Southampton Club at 33 Hill Street, both designed by Grosvenor Atterbury; the picturesque railroad station at the Railroad Plaza in the North Main Street Historic District, built in 1902; the late Gothic Revival style church at 168 Hill Street, built in 1908; the 1910 Neoclassical style village hall at 23 Main Street, designed by Burrall Hoffman; the Neoclassical style (former) high school building at 116 Hampton Road, built in 1912; the large, Neoclassical style World War I Memorial at the north end of Lake Agawam, built in 1923 and designed by Goodwillie and Moran; the handsome Neoclassical style (former) town hall building at the northeast corner of Main Street and Hampton Road, built in 1925; the late 1920's Colonial Revival style commercial block at 2-22 Main Street, designed by Grosvenor Atterbury; and the Georgian Revival style grade school building at 166 Hampton. Road, built in circa 1930. As Southampton reached the peak of its summer resort development between 1910-1930, the summer houses became larger and more elaborate when compared to the rambling turn-of-the-century Colonial Revival and Shingle style Summer Colony residences. The estates built during this period were more grandiose and displayed various fashionable early twentieth century architectural styles including the Georgian Revival, Jacobethan Revival, and Spanish Colonial Revival styles. These impressive mansions were set on larger, lushly planted parcels of land and scattered throughout Southampton Village Historic District's Summer Colony. In addition, a small cohesive group of 1920's estates which constitute the Beach Road Historic District reflect this phase in the village's development. Constructed between 1920-1930, these oceanfront mansions were built by some of America's most prominent families including the Mellons and Duponts. Each district property has a large impressive main house facing the ocean and displays architectural styles which were popular in fashionable resorts during this time period, primarily Georgian Revival and Spanish Colonial Revival idioms. These estates were built on Southampton's somewhat isolated barrier beach and are physically separated from the Summer Colony by undeveloped land. The Beach Road Historic District represents the peak of Southampton's affluent resort development and was the last concentrated historic estate development in the village. Balcastle, the 1910 Gothic Revival style residence on the northwest corner of Herrick and Little Plains Roads, and the Dr. Wesley Bowers Residence on Beach Road are both isolated individual component properties which also represent Southampton's most active 1910-1930 summer resort development. These large distinguished properties are well-recognized landmarks in the village due to their conspicuous locations in non-historic neighborhoods. They display the distinctive characteristics of their respective architectural styles and retain a high level of integrity, workmanship, and attention to detail. Balcastle is architecturally significant as Southampton's only example of castellated Gothic Revival style architecture. It displays many of the idiom's distinctive characteristics, including an overall asymmetrical, picturesque appearance, pointed arches, window tracery, and castellated roofline. The Bowers Residence is an architecturally significant example of the village's opulent early twentieth century summer resort development. Built in 1930, it retains a handsome Spanish Colonial Revival style mansion which is prominently sited within an uncompromised oceanfront setting. Both of these properties contribute to Southampton's rich early twentieth century architectural heritage. As noted earlier, many of Southampton's distinguished late nineteenth and early twentieth century buildings were designed by locally and regionally prominent architects and architectural firms and successful local builders. Many of these same architects practiced throughout Long Island and the northeast, designing elegant residences for many wealthy American families. In particular, McKim, Mead, and White; Walker and Gillette; Carrere and Hastings; Peabody, Wilson and Brown; John Russell Pope; and especially Grosvenor Atterbury were designing handsome estates and civic buildings in many of Long Island's affluent North Shore and South Fork communities. McKim, Mead, and White was a well-known New York City based architectural firm which was active during the last quarter of the nineteenth and early twentieth centuries, designing many outstanding buildings primarily northeast. This successful partnership was formed in 1880 and included Charles Follem McKim (1847-1909), William Rutherford Mead (1846-1928), and Stanford White (1853-1906). Their public and domestic works are extensive and include a long list of churches, clubs, commercial buildings, libraries, school buildings, and many residences. A. Stewart Walker and Leon N. Gillette formed their architectural partnership in 1909 and were based in New York City. Their most successful residential works are located on Long Island but they were also active in New York City and Westchester County, New York. John Mervin Carrere (1858-1911) and Thomas Hastings (1860-1929) formed an architectural partnership in 1885. This New York City based firm developed a successful practice which included a wide range of buildings at a variety of east coast locations. Peabody, Wilson, and Brown were active during the early twentieth century and are responsible for designing numerous residences on Long Island. Julian Peabody (1881-1935) was the senior partner in this New York City based firm, which was organized in 1924. John Russell Pope (1874-1937) was a prominent American architect who designed many distinguished buildings in the United States and abroad. His numerous works include public buildings, colleges, churches, hospitals, and private residences. Grosvenor Atterbury (1869-1956) was a New York City based architect who had a long successful career as a designer of distinguished upper-income residences primarily on Long Island. Of all the architects who practiced in Southampton, Atterbury designed the largest number of buildings. Robert H. Robertson (1849-1919) was also active in Southampton during the late nineteenth century. This well-known New York City based architect designed a variety of public and residential buildings throughout his forty-year career; many of his commissions were located in New York City. James Brown Lord (1859-1902) was a New York City based architect who had a successful practice during the late nineteenth century. He designed public and residential buildings in the New York/Long Island Metropolitan area. Bruce Price (1843-1903) also designed a summer residence in Southampton. He was a prominent American architect who practiced during the late nineteenth century and designed a large number of public and residential buildings primarily in the New York Metropolitan area. There are other less well-known architects and local builders who also contributed to the design of Southampton's historic resort period building stock. Many of these buildings were influenced by the distinguished works of the numerous prominent architects and firms who worked in the village during the late nineteenth and twentieth centuries. In addition, in-depth research in the future may reveal the names of other architects and buildings who were responsible for some of Southampton's uncredited but nevertheless distinguished period buildings. Two notable local builders who established successful careers during the village's prosperous resort development are Edward Elliston and Madison Jagger. In particular, Edward Elliston designed and built Balcastle at the northwest corner of Herrick and Little Plains Roads, an isolated, architecturally significant, individual component property. Prominent landscape architects may have also worked on Southampton's handsome, lushly planted summer properties and additional in-depth research in the future may reveal their names and associations. Many well-known people visited the village during its rapid late nineteenth and early twentieth century resort development. A large number of successful business people, artists, architects, and socially prominent families chose Southampton as their vacation retreat and some of their descendants still do. A random sampling of those who resided in the village during its historic resort development period include: Alfred Schermerhorn, Marshall Field, Edmund I?. Lynch, John F. Harris, Henry F. Dupont, architect Grosvenor Atterbury, painters Elihu Root and Fairfield Porter, and Nicholas Murray Butler, (former) president of Columbia University. Many prominent American families and individuals are clearly associated with the village's historic summer resort development; however, additional research is necessary to document their backgrounds, lifestyles, and associations with specific properties. The stock market crash of 1929 and the depression which followed marked a dramatic decline in construction throughout Long Island and Southampton in particular. As a result of these events, 1930 closes the village multiple resource area's period of significance. At present, Southampton and the South Fork in general is experiencing extensive modern (mid and late twentieth century) residential development which threatens what remains of the village's undeveloped land, the majority of which is cultivated. The four historic districts and four individual component properties which constitute the Southampton Village Multiple Resource Area nomination represent the community's historical and architectural growth and development from its settlement in the mid-seventeenth century to 1930. The nominated historic properties reflect the village's gradual agrarian development up until the mid-nineteenth century and its rapid transformation into an exclusive upper-income summer resort during the late nineteenth and early twentieth centuries. O'Brien, Austin N., Southampton Village Multiple Resource Area, 1986, nomination document, National Park Service, National Register of Historic Places, Washington, D.C.